It quickly became apparent I would make a skeleton, although my solution for the skull looks more like Bender from Futurama. As well as the feet I used Plate 1X1 Round W/3.2 Shaft for the shoulders, loosely attaching them upside-down to a 2x2 round plate. 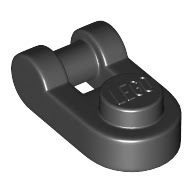 It is an incredibly weak and ill-advised connection, but an interesting one: the rounded end of the part meant I could just manage to connect the studs to the 2x2 round plate despite the latter having an axle going through its centre. The ribcage uses Cross Holes W/ Double Ø 3.2 Shaft Hole (24122) at the bottom, which inspired me to use larger Technic elements of similar appearance for the larger ribs above. For the hips I used Plate 1X2 W. 2 Shafts Ø 3.2 (18649), which Tom used for limbs. I used bars for limbs, to make full use of the new hinge made of 3.2 Shaft W/3.2 Hole (23443) with Holder Ø3.2 W/Tube Ø3.2 Hole (11090), which forms the joints at the knees and elbows. I'm not especially happy with the final result, and of course he'd look a lot better in all-white! But he's a cute little guy I guess. The most amazing thing about him is that he actually stood up at all, let alone long enough to be photographed. I don't remember how many times those arms fell off though.